Good evening and welcome to the 80th issue of the Airport CEO development blog! After yet another productive week we’re here to tell you all about it. We’ve also got some good news on the Steam Direct progression but we’ll say this already here so that you don’t get your hopes up: No release date and no price will be revealed today. More information on this below, as we discuss the Steam Direct update. But first… let’s skip celebrating the fact that we’ve posted 80 devlogs (since we don’t have time for or deserver any celebration yet) and let’s get into the productiveness of this week. However, due to current time constraints and focus on working with the product, except a somewhat compressed devlog today. As a result of the previous week’s flight planning overhaul we were forced to also explore complex terminal structures as gate specific flight scheduling imposes logical challenges that the previous system did not. Previously you were really only able to construct one secure zone which connected to all stands. While it was physically possible to build separate secure zone areas it would most likely not have worked as the gate assigning system did not take this aspect into account. While this was sloppy and induced technical debt it didn’t pose an immediate threat since we weren’t planning on implementing stand specific flight assigning anyway. That all changed when we recognized that there was a notable per-stand scheduelikg demand from the community and so here we are. We dealt with two major questions in relation to separate secure zones. How will a passenger know which security check-point to use to reach their gate and how will an employee know which security check-point to use to reach their job task? We splashed some code magic on those issues and came up with solutions that we believe to be viable and that in our test scenarios work well but which of course will need to be tested by you as soon as possible. 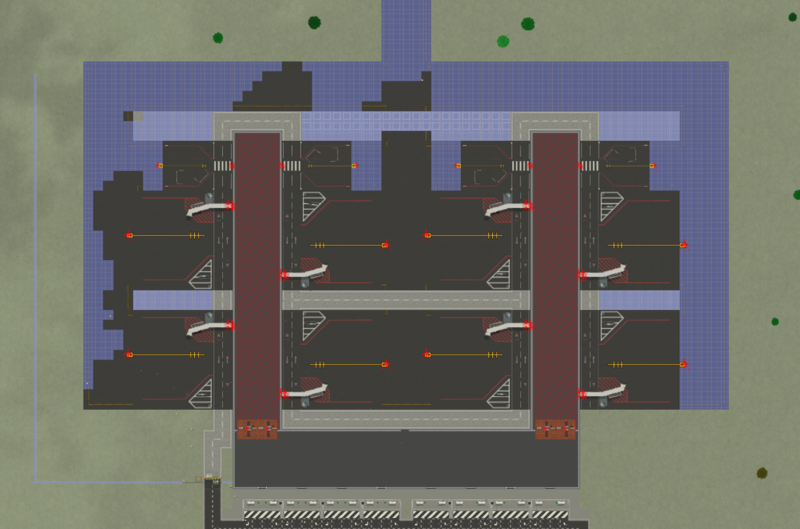 With the new complex terminal layout it is now possible to construct terminals as the ones below. Please excuse the construction mess. We were doing some usual testing. This was a proof of concept terminal that we built really quickly, hence the ugly aspect ratios. Earlier this past week we had our Steam build approved as expected. This marks the last and final stage of the Steam Direct release process and we are now in total control of when the game will be released. However, we still have the biggest obstacles yet to overcome: Ourselves. We are currently heavily focused on QA and are running internal testing programs. We are still very much on target for our internal release date but we’d like to refrain from announcing that date and the game’s price point until we have signed off on said internal testing program. Many of you will feel frustrated by this fact, but rest assure that the release date does not change internally in any way because of this. We hope that our transparency throughout this process facilitates your trust in us. And frankly, it’s always more fun to drop news out of the blue than in a devlog. Enjoy this quick .gif where we were testing out passenger behavior when running passengers at times ten the normal ticket sale per lightweight aircraft. It was indeed interesting to review the chaos that unfolded in such a cramp terminal. That is actually it for this week. We have a lot of work to do this coming week and will keep you posted on any important progress we make. Thank you for tagging along on this ride and fly safe! Oh, and before you leave. 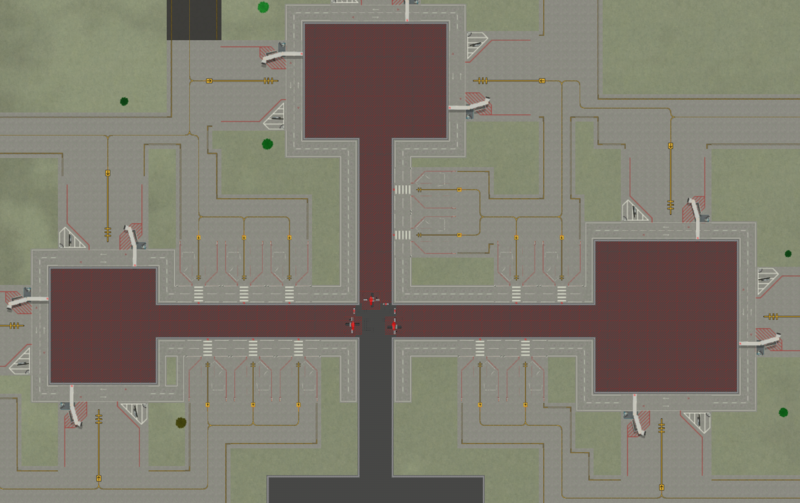 Make sure to head over to the Airport CEO subreddit where you can participate in a design contest to win a free copy of Airport CEO! Just press this link. As we say in Sweden: Gratis är gott!